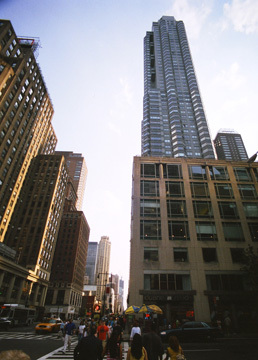 Very vigorous in its modeling and prominent, this 55-story, pale green giant is one of the city's stellar residential skyscrapers. It is one of the few aluminum-clad towers in the city. Whereas some of the others are office buildings with patterned panels, this tower's "skin" is plain and its color does not belie is metallic nature. The color, in fact, is the most questionable element of this project. Clearly, the architects, Davis, Brody & Associates, one of the city's most innovative residential designers, were in a courageous, experimental mode. The pale green probably looked great in pastel renderings, but in reality, it is a bit weak-looking, especially for such a very robust structure. Indeed, imagine this building in stainless steel, or polished black granite! What a knockout that would be, enough to sock it to "high-tech" master architects. A deeper shade of green would probably have been more effective, and given its name, more appropriate. 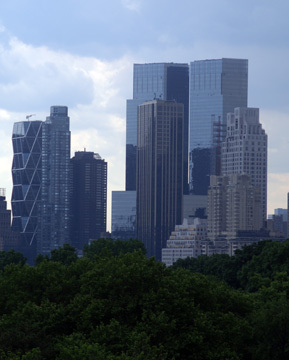 Regardless of color, however, this tall, 160-unit tower affords fantastic views of Central Park and its site is such that such views are not blocked significantly from the Time Warner Center just across 58th Street on the former site of the New York Coliseum on the west side of Columbus Circle. The views are incredible because most of the units have very large and deep bay windows that afford comfortable views in three directions. For connoisseurs of water-tank enclosures, this tower boasts one of the prettiest, an octagonal shape that is the perfect cap to this very modern "pneumatic" tower. A decade after it was erected, this project's location was bustling with large computer stores, household goods stores, theme restaurants and the continued boom of the nearby Lincoln Center district. The Time Warner Center, of course, would up the ante with its expensive restaurants, its fabulous Whole Foods store, curved retail atrium and expensive condominiums. 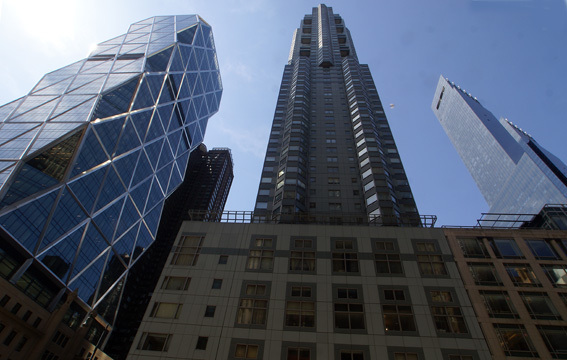 It was soon followed by Sir Norman Foster's notched office tower addition with stainless steel diagonal bracing to the Hearst Building on the southwest corner of 57th Street and Eighth Avenue and in 2008 the owners of the full-block Newsweek Building directly across Eighth Avenue from this tower announced they would replace its dark brown masonry facade with one of reflective glass. With neighbors like these, its unlikely property values are going to plummet in this building especially since the Zeckendorfs completed another project nearby in 2007 at 15 Central Park West that set new residential records for price per square foot. Just to the south of Columbus Circle, this project might appear to be at the hub of a major traffic bottleneck. Surprisingly, the circle's traffic is nowhere near as terrible as the approaches to the Queensborough Bridge across town. Within walking distance of Central Park, Lincoln Center, the theater district and the Plaza office district, this location is hard to beat. It also has excellent public transportation.